An oversized racket, one pocket-sized ball and an opponent who must stay on the opposite side of the net. How dangerous can a sport like this - tennis specifically - be? Somewhat. Have you ever had tennis elbow or been drilled in the stomach by a 90 mph serve? In Australia, for example, tennis is the third most popular sport behind aerobics and golf. Of the roughly 937,000 tennis players in that country, 55 per cent of adult injuries occurred predominantly to the lower limbs; in particular, they were knee and ankle sprains. The cause? Over exertion, according to the Victorian Injury Surveillance System (VISS). On the other hand, child tennis injuries occurred mostly above the waist - fractures of the radius/ulma (seven per cent) and wrist sprains/strains (four per cent), according to VISS. The cause? Falls. The best way to avoid any sport-specific injury is to develop sound, basic skills - no matter whether you are an adult or child. When deciding who to hire as a tennis coach, ensure that he/she is accredited with your country or area's tennis association and that he/she undergoes regular re-training and re-accrediting. "Coaches should promote techniques that maximise biomechanical advantage and protect from excessive forces and over use," according to the Smart Play Program of Australia. Watch lessons of current students - are they all tennis all the time, or is there a mix of tennis and other training activities? A good instructor will pepper each lesson with a mix of tennis strokes and other activities, which help to make the student a better athlete. Check to see how many students are on the court at one time and what is the student-teacher ratio? Robert Gamble of Camping Magazine recommends four players per court and one instructor per court. "Often [instructors] incorporate larger groups among beginners and younger [students]. However, younger, inexperienced [students] have less racket and ball control and need more individualised attention, making larger numbers of inexperienced players on the court potentially more dangerous and less productive." Once on the court, there are certain dos and don'ts - all in the name of safety, including no jumping or climbing on the net. Before conducting a running drill, clear the court of all balls, including those by the back fence. "Stepping on a ball can cause a twisted ankle or an even more serious injury," writes Gamble. Feed balls from behind the net. For most drills, balls should be fed across the net as this protects the instructor from an over-zealous ball-hitting student. Never stand in front of players who are serving. Getting clocked in the back of the head with a serve is not a pleasant experience. Don't play on wet courts. The lightest drizzle can create a slick surface, particularly on a hard surface or grass court. Where there is more than one student on the court at the same time, keep the ball hoppers at the back fence. "This will prevent anyone getting balls from the hopper being hit by another's back swing," according to Gamble. If there are some students waiting their turn to participate in a drill, have them stand at the back fence or at least outside the alley. This opens up the court and lessens the possibility of someone getting hit by a stray follow-through. 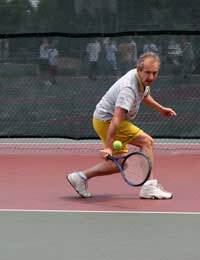 Tennis requires its players, whether they be professional or recreational, young or an adult - to be in shape - aerobically and anaerobically - due to the sprinting, stopping, starting, bending and stretching along with the repetitive stresses on the musculoskeletal system. Stretching, particularly of the shoulders, legs and calves will help reduce game injuries. Strengthening exercises will also help prevent injuries, as well as increase performance level. "Isometric exercises for the forearm and hand will improve grip control and minimise the effects of ball impact on the arm and elbow," according to the Riley Hospital for Children. Using hand weights will help strengthen the shoulder and the muscles, while abdominal and back work will strengthen your torso. Of course, aerobic cross training, such as swimming, cycling or jogging, must also be done - beyond what is done during a game. The additional training will vastly improve your game. Choosing the right equipment can make all the difference and transform one's game from average to above-average. However, this does not mean the higher the ticket price, the better the equipment. It is all about what best suits your body. For example, shoulder and elbow injuries can occur because the player is using a racquet with the wrong grip size, is too light or heavy, or the racket is strung with too much or little tension. Make sure to wear shoes made specifically for tennis, as they are better for the side-to-side sliding that occurs during a game. "The heel of your shoe should fit tight to keep your foot from sliding side-to-side within your shoe," according to the Riley Hospital. "Make sure that your heel and toe area in the shoe is soft and cushioned." Also ensure that your ankle does not roll around in the shoe. As well, whenever possible, play on courts that provide a bit of give such as clay or fast drying. However, if you have to play on cement, asphalt or synthetic courts that provide no cushioning - wear heel inserts to help absorb the shock and prevent lower back injuries. When forearm muscles are used incorrectly, tennis elbow occurs. To prevent this common injury, warm up before you play; avoid playing when you are tired; stretch your wrists after your warm-up - strong wrists take stress off your elbows; always bend your arm when you serve the ball; avoid a lot of topspin on the ball by rolling over with your wrist and elbow when you hit ground strokes; and stay hydrated.